Truth be told, I wouldn't even mind having this on my desk. 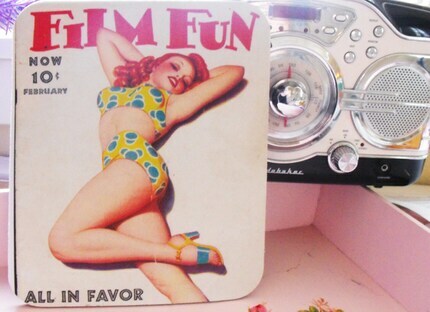 I have always loved vintage pin-ups. Vintage Lucy's knows that Victoria's Secret has nothing on the classic beauties of the 40's and 50's. Head over to her shop and take a sneaky peak. 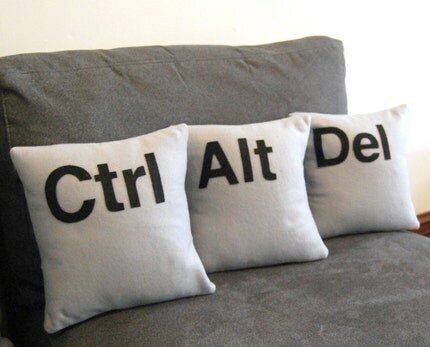 Gaming guys and computer nerds will adore these decorative pillows. These geek-chic items will add some flare to any modern apartment, either in the bed room or on the living room couch. Visit Diffraction Fiber for pillows, cozies, accessories, and other unique items. Dressy occasions can be a real drag for a casual guy, but if he can add something a little bit obscure to maintain a sense of mysterious coolness, then he will surely survive. 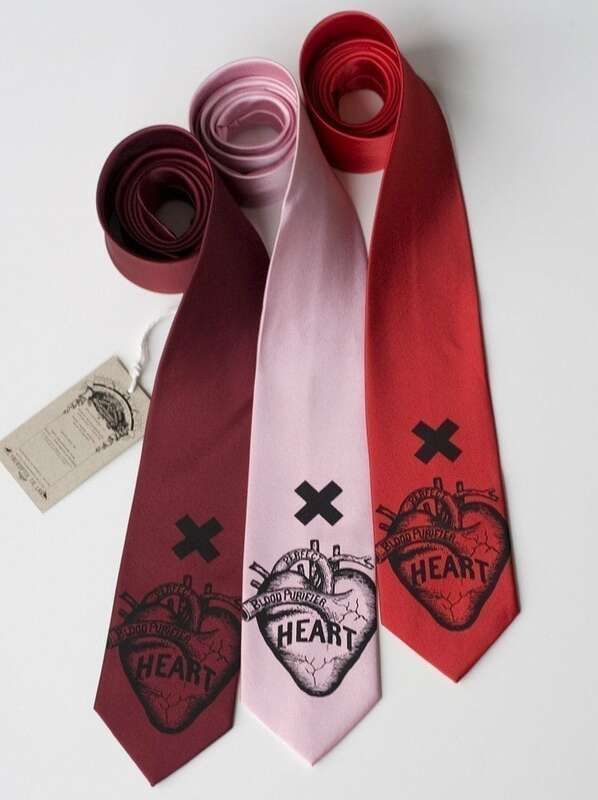 Have a little heart with the Heart Attack tie from the Cyberoptix Tie Lab. Now that's a valentine! Guys love nothing more than a makeout session with their favorite gals, so give your guy a "subtle" reminder that he is the only one you want to make out with. Thanks to Near Modern Disaster, you can leave a little note that he'll be sure to remember. Guys' places should not look overdecorated, but they shouldn't be plain and boring either. This modern graphic print has just enough color to make it stand out and become the conversation piece that you can work around a room full of plain black and white furniture. Dela Flamant offers many screen printed designs for your viewing and decorating pleasure. This is the ultimate piece of awesome geekery. 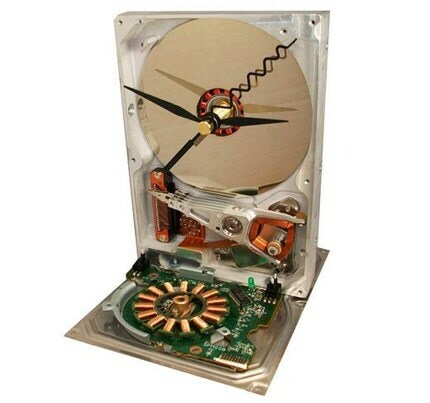 Techies would be proud to tell time via this revamped hard drive. There are many interesting versions of this clock at Teco Art. 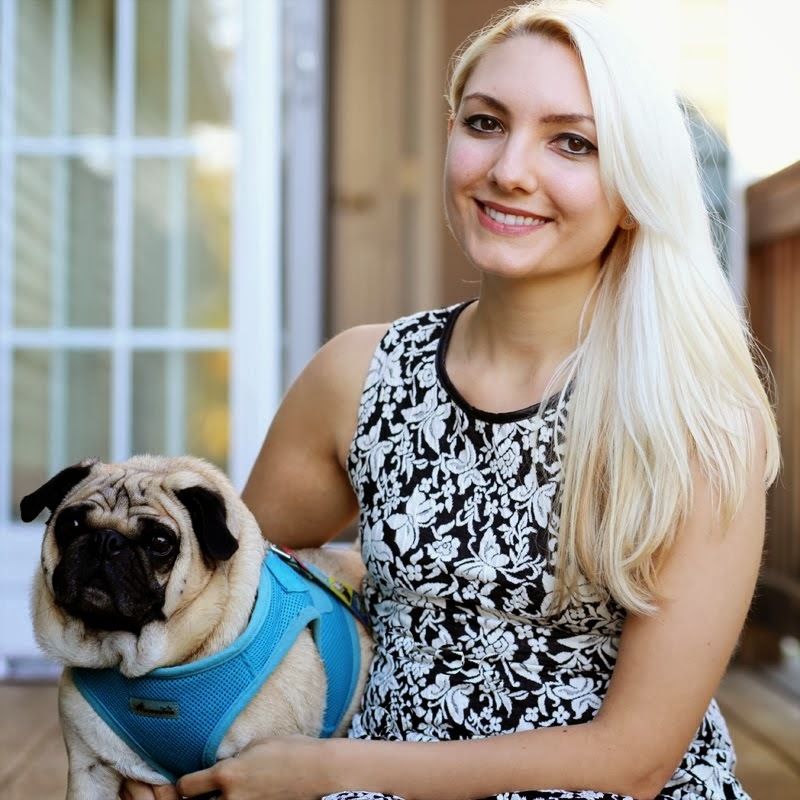 Bright neon colored shirts are in style at the moment. Everyone wants to stand out in a crowd and keep from blending in. 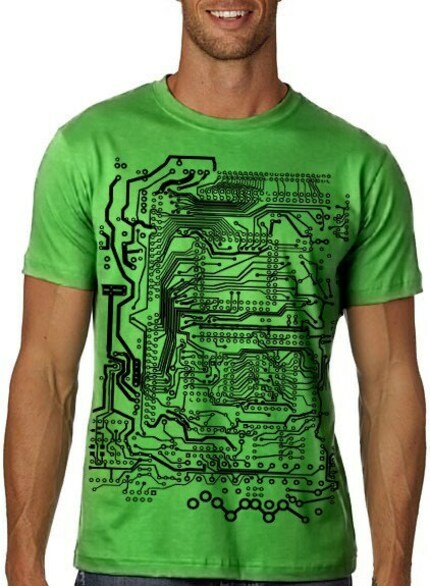 The best way to do this is to wear a bright lime green shirt that contains a huge circuit board model, and thankfully, Nonfiction Tees makes this possible. 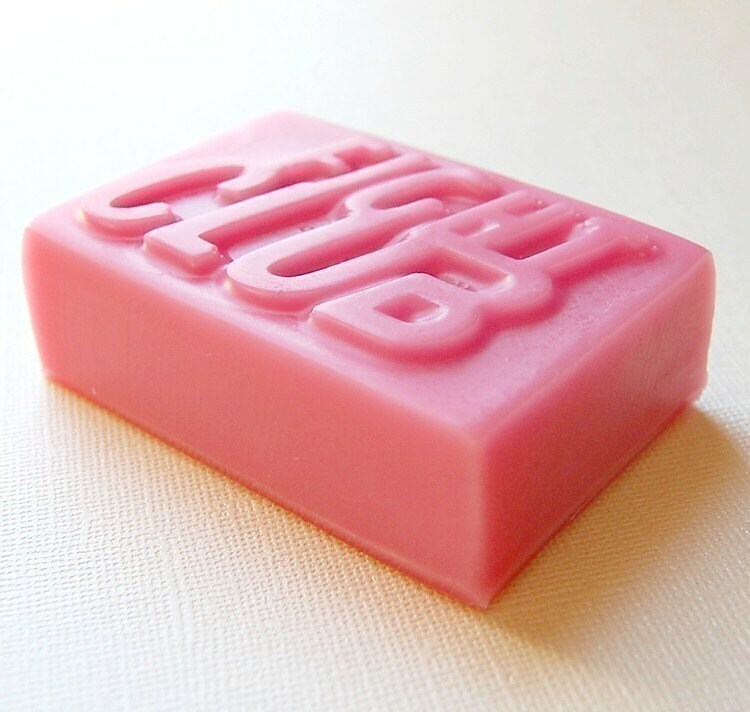 Music lovers will appreciate this item from Beautiful Skin. Protect your assets with these wonderful leather cases. The cases are the perfect size for iPhones and iTouches. 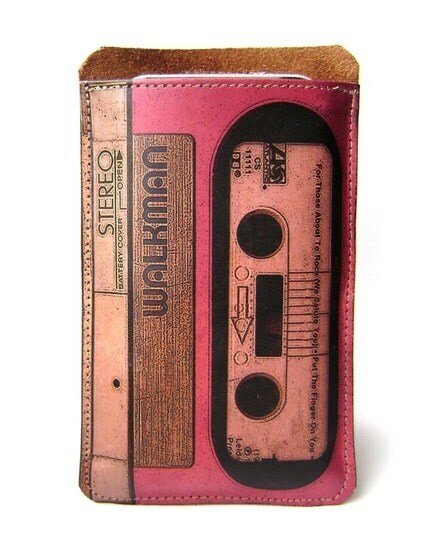 A lot of money goes into the electronics that house music, so be kind and give the house a home in this cassette cozy. 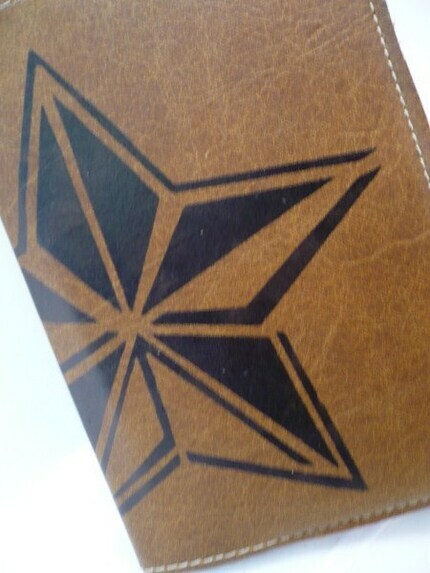 Several other cases with various designs are also available. At the end of a long day, a guy can place his deepest thoughts in a handprinted journal from In Blue. There are other designs, including blackbirds and owls, that are fantastic and make great journals for men and women alike. This nautical journal is my favorite, and I know it will be Jer's, too. I hope that the boyfriend does stop by tonight and check out this one, since it is my little shout out to him. In fact, it's my shout out to all the guys out there who stop in to check out Vamp Up Vintage! Awesome picks, thanks for including my poster!